With Shazam! having the advanced screenings this past Saturday, early reviews are in, and its Rotten Tomatoes score is sky high. Shazam! rolls in with a 95% Rotten Tomatoes critics score as 53 are Fresh to only 3 Rotten, which sees it currently topping Wonder Woman (93%) for the best DCEU movie and even tops Christopher Nolan's Batman The Dark Knight (94%). 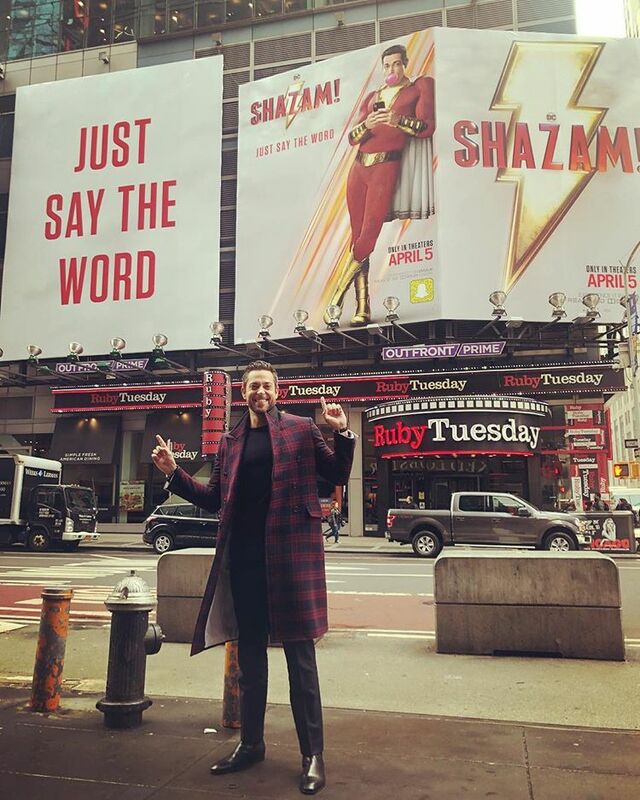 Earlier it was also reported the flick is tracking at only a $40 million weekend opener, so possibly with the reviews being positive and with good word-of-mouth, Shazam! may open to higher numbers. I'm thinking more along the lines of a $55-70 million opener. "I’ve been so blessed in my life, in so many ways. I’ve had incredible jobs, that have been the foundation on which I’ve been able to build the rest of my career, and life," Levi posted on Instagram. "And to have been able to build to here, to now, to THIS, is beyond my wildest dreams. I genuinely hope it never all completely sinks in. I hope it always remains, at least in part, dreamy." Shazam! gets officially released April 5, 2019 and also stars Asher Angel as Billy Batson, Jack Dylan Grazer as Billy’s best friend and ultimate superhero enthusiast, Freddy, Djimon Hounsou as the Wizard, Faithe Herman, Grace Fulton, Ian Chen, Jovan Armand, Marta Milans and Cooper Andrews. Synopsis: We all have a superhero inside us, it just takes a bit of magic to bring it out. In Billy Batson’s (Angel) case, by shouting out one word—SHAZAM!—this streetwise 14-year-old foster kid can turn into the adult Super Hero Shazam (Levi), courtesy of an ancient wizard. Still a kid at heart—inside a ripped, godlike body—Shazam revels in this adult version of himself by doing what any teen would do with superpowers: have fun with them! Can he fly? Does he have X-ray vision? Can he shoot lightning out of his hands? Can he skip his social studies test? Shazam sets out to test the limits of his abilities with the joyful recklessness of a child. But he’ll need to master these powers quickly in order to fight the deadly forces of evil controlled by Dr. Thaddeus Sivana (Strong).